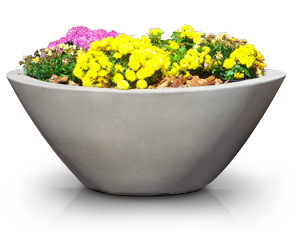 These tapered planters are made of steel-reinforced precast concrete for maximum durability and minimum maintenance. The tapered look complements the flowers and fittingly puts them on display. These heavyweight planters are strong enough to support even large root systems and their substantial weight naturally discourages theft. Ideal for commercial and residential settings. Three drain holes at the bottom provide proper drainage.